Your daily dose of energy for the body & mind - vitality rejuvenation. A composition of perfectly matched ingredients, which affect the flow of physical and mental energy throughout the day and the sleep at night. At the same time Vitality Boost ingredients (iron, magnesium, calcium and black pepper extract which contains piperin), by increasing metabolism, help relax at night and as a result increase energy during the day. Your daily dose of energy. 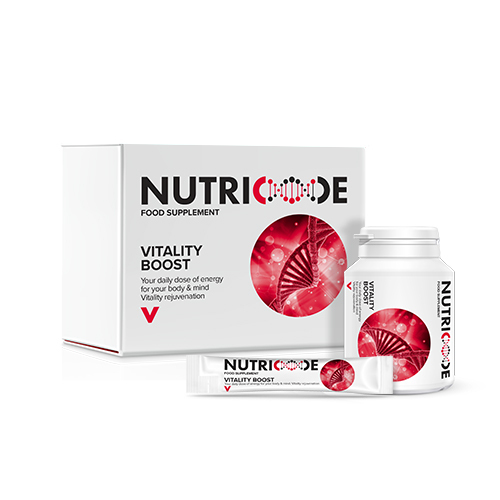 Niacin, pantothenic acid and riboflavin, additionally reinforced with caffeine contribute to the reduction of tiredness and fatigue. Pantothenic acid additionally affects brain efficiency. B group vitamins support normal energy-yielding metabolism (thiamine, riboflavin), take care of the nervous system (riboflavin, vitamin B6) and help maintain proper psychological functions (biotin, vitamin B6). Thiamine is responsible for the normal function of the heart. Vitamin E contributes to the protection of cells from oxidative stress. Contains sweetening agents. Contains caffeine (50 mg/sachet); it is not recommended to use by children and pregnant women. Directions: Consume the content of 1 sachet per day. Do not exceed recommended servings for consumption during the day. Rich source of vitamins and minerals, which increase metabolism at night, to let you operate more efficiently during the day. Chromium contributes to the maintenance of normal blood glucose levels and provides normal macronutrient metabolism. Magnesium supports electrolyte balance. Selenium takes care of the immune system and helps protect the cells from oxidative stress. Iron participates in the normal oxygen transport in the body. Copper contributes to normal energy-yielding metabolism. Zinc assists in the proper metabolism of carbohydrates and fatty acids, whereas, piperine from black pepper supports digestion and absorption of nutrients. Directions: Take 2 tablets a night. Consume with water. Do not exceed recommended servings for consumption during the day. Daily Sachets Ingredients: water, orange juice concentrate, guarana extract, green tea extract, caffeine, antioxidant: ascorbic acid, thickening substance: xanthan gum, DL-alpha tocopheryl acetate (vitamin E), aromas, nicotine amide (niacin), preservatives: potassium sorbate and sodium benzoate, calcium D-pantothenate (pantothenic acid), pyridoxine hydrochloride (vitamin B6), riboflavin 5’-phosphate sodium (vitamin B2), folic acid, sweetening substances: sucralose and neohesperidine DC, thamine mononitrate (vitamin B1), cyanocobalamine (vitamin B12), D-biotin. Night Tablets Ingredients: calcium phosphate, bulking agent: microcrystalline cellulose, magnesium oxide, L-ascorbic acid (vitamin C), DL-alpha tocopheryl acetate (vitamin E), potassium iodide, nicotine amide (niacin), iron (II) sulphate, zinc sulphate, anti-caking substances: silicon dioxide and magnesium salts of fatty acids, sodium molybdate (VI), black pepper extract, Calcium D-pantothenate (pantothenic acid), sodium selenite (IV), chromium (III) chloride, pyridoxine hydrochloride (vitamin B6), riboflavin 5’-phosphate sodium (vitamin B2), folic acid, copper sulphate, thiamine mononitrate (vitamin B1), cholecalciferol (vitamin D), manganese sulphate, cyanocobalamine (vitamin B12), phylloquinone (vitamin K), D-biotin, coating (thickeners: hydroxypropylmethylcellulose and hydroxypropylcellulose, bulking agent: cellulose, firming agent: talc, anti-caking agent: fatty acids, colours: E171 and E172).